As Pakistan implements the court order on switching to the language, has the government considered the consequences of rekindling old disputes? An early Muslim League president, the Aga Khan, thought Pakistan should adopt Arabic as the national language. Pakistan couldn’t do it, but General Zia-ul-Haq made it compulsory; that too didn’t work. The constitution of Pakistan decrees, under Article 251, that the official language of Pakistan shall be Urdu. Pakistan should have enforced the article 30 years ago, but it didn’t because the provinces other than Punjab didn’t agree. But Urdu spread nevertheless as the dominant idiom of Pakistan without being enforced. The police wrote its FIRs in Urdu — barring interior Sindh where Sindhi is a written idiom — but the courts wrote their decisions in English. The official text of the constitution also remained English. The government in Islamabad has moved to implement the verdict of the Supreme Court and ordered the ministries to switch to Urdu immediately. It has surrendered to an eccentric judge, Justice Jawwad Khawaja, whom lawyers despise for being rude. The civil servant elite, who take their competitive entry exams in English, will now have to develop persuasive talent in Urdu. An alarmed commentator wrote: “Summaries and minutes of meetings and communications between the ministries are to be made, and tests for induction in government service are to be conducted, in Urdu.” And if the federal civil servant is Pashtun or Baloch, and has made it into the federal bureaucracy because of English, his goose is cooked. English is a compulsory language in Urdu-medium schools and science students with Urdu-school-acquired knowledge have to make a switch to English in college. Before 1947, the Muslim League was upset about Hindi. In his A History of the All-India Muslim League 1906-1947 (2013), Rafique Afzal observes: “Muslims were agitated the most seriously by the Wardha Scheme of basic education, or the Vidya Mandir Scheme, which was inspired by the spirit of ahimsa (non-violence) and unity of the ‘Indian nation’. The publication of the Vidya Mandir Scheme and its planned introduction by stages in the Hindu majority provinces stirred up reaction among the Muslims. On 4 December 1938, the central council appointed an eight-member committee to examine this scheme to find out its impact on the Urdu language and its script and on the ‘separate national identity’ of the Muslims.” Needless to say, the Wardha Scheme got a drubbing. After 1947, Pakistan imposed Urdu as the national language on East Pakistan, where a highly developed Bengali idiom was a part of national identity. Although some prominent Bengali leaders like Huseyn Suhrawardy were Urdu-speaking — while being proficient in English — there was a linguistic revolt that led to the separation of East Pakistan from West Pakistan in the ripeness of time. East Pakistan lived under oppression and some West Pakistani governors tried to impose the Arabic script on the subject Bengali population. In pluralist India, the Constitution too contains a “national language” provision, but any expressed intent of enforcement even at the federal level might meet with strong opposition. If I recall correctly, then-Chief Minister Mulayam Singh Yadav’s effort at imposing Hindi in Uttar Pradesh had resulted in a Tower of Babel of languages because of the competing idioms in a province boasting a bigger population than Pakistan today. Urdu in Pakistan is a vector of emotion, mainly religious and nationalistic. (Most great Urdu literature was produced during the British Raj.) English, the colonial idiom, has a rational discourse, not because we become rational when writing it, but because English cracks under emotion and starts sounding ridiculous — “drunk with the wine of nationalism”, etc. You can stuff the bureaucracy with Urdu-medium and madrasa-based graduates, but the private sector will favour only graduates from English-medium institutions. Private-sector schools are all English-medium, which means teaching in English right from Class I, as opposed to Urdu-medium schools where English is a separate subject from Class VI. An early Muslim League president, the Aga Khan, thought Pakistan should adopt Arabic as the national language. Pakistan couldn’t do it, but General Zia-ul-Haq made it compulsory; that too didn’t work. Many politicians, including Imran Khan, say Pakistan should not have a “dual” system of education, pledging to do away with English-medium schools that are expensive and out of reach for the poor masses. We can become Afghanistan, which was never colonised and is linguistically divided between the north and the south, without the glue of English that binds India and makes it a power to reckon with in a globalised world. 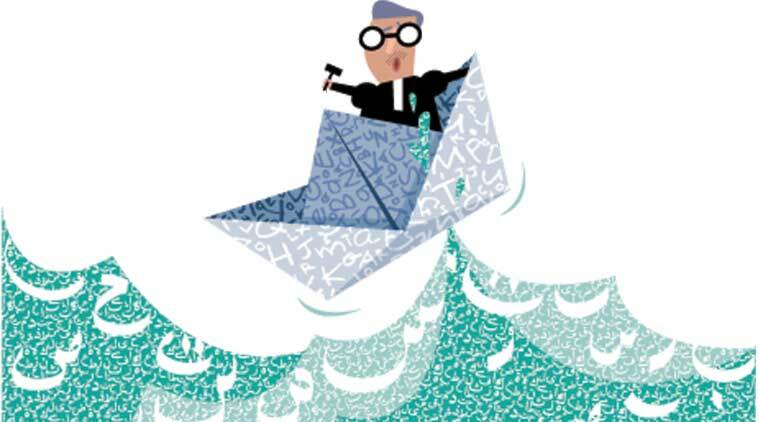 Daily Pakistan reported on July 22 that the Supreme Court, which triggered the latest national language spasm, “has translated its latest decisions into Urdu which is full of blunders”, adding that an earlier effort to get the lower courts to issue verdicts in Urdu had made shipwreck in the 1980s. It then added a tricky proposal: Instead of getting a paid translator to convert the decisions into Urdu, the honourable judges should write the decisions in Urdu. In India, English bound the various linguistic groups together, then bound India with the rest of the world. As part of the global market and its “monoculture”, we have a tough time maintaining nationalism and ideology, which require a walled environment repelling external ideas that puncture our thinking through the internet. And if your nationalism is arrested in a warlike posture and your ideology is arrested in time, your national language is a toxin that will disable generations till the nation-state has metamorphosed into a new form.